On the low line ice, there is a aux plug on the rear on the center arm rest. At the back of this there is a muti plug with a number of wires. Does anyone know what each of the wires connects to? I want to put an extension 3.5mm stereo socket at the front, and I need to splice into this connector. Check out this link. You would still be able to use the rear incase of a portable DVD or something, and then switch to front for your IPod. http://www.impactacoustics.com/product.asp...;sku=52065 "A lack of planning on your part does not constitute an emergency on my part"
when Rob gets back from france ask him as his goes to the back of the radio . On the back of the Jack connector? where exactly? Do u have a pic of it? This is the connector, there are two black wires , one red and one blue. I am guess one of the colours is one channel, the other the second channel, that leaves the black wires, one of which is the ground, but what the other is, unless a second ground wire I do not know. Red ,blue and black in the black sheath are all for aux input. Red and blue are left and right and black is ground. I would suspect the second black is some sort of activation wire. If you were to splice into the red, blue and black ..it would not work untill you plug something into the aux socket. 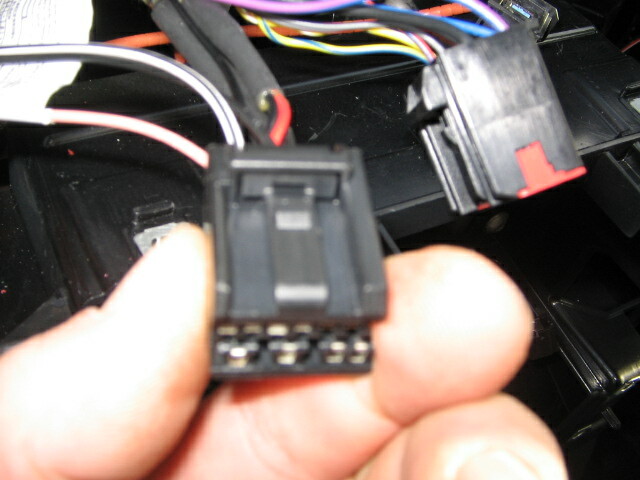 The second black wire is a negative .It comes from a ground point on the car. Perhaps by inserting the plug it makes a contact and joins both the negatives together. If you were to connect to the red and blue and then join both the blacks to the aux negative ..it would do away with the need for a jack plug to be inserted. I will take the unit out and put a meter across the contacts, w/wo a plug in to see if the link up. On my SE with Standard Audio - I do not even have the connectors on the rear side af the center arm rest. Does anyone know whether at least the radio has the ability to get AUX connected (it has the button for it anyway) - are some AUX cables located on the back side of the radio that can be possibly used? I remember someone found Aux connections at the back of the glovebox, the post had pictures with it which may help. 1st - Remove the blanking plate were the aux socket should be ...i think that the wiring plug is there as standard...get yourself a new plate with the aux socket on ..not very expensive.